"While retaining the typical 911 design, this is the biggest evolution by now in the history of our top GT model," says Head of Porsche Motorsport Dr Frank-Steffen Walliser. The new 911 RSR is a completely new development: the suspension, body structure, aerodynamic concept, engine and transmission have all been designed from scratch. The engine concept has enabled the designers to install a particularly large rear diffuser. Combined with a top-mounted rear wing adopted from the LMP1 race car, the 919 Hybrid, the level of downforce and the aerodynamic efficiency were significantly improved. "For the 911 RSR, we deliberately focussed on a particularly modern and light normally-aspirated engine, as this gave our engineers immense latitude in developing the vehicle," explains Dr Walliser. "Apart from that, in principle, the LM-GTE regulations stipulate the absolute equality of various drive concepts, as the torque characteristics of turbo and normally aspirated engines are aligned." Depending on the size of the restrictor, the new normally-aspirated unit puts out around 375 kW (510 hp). Shift paddles on the steering wheel actuate the sequential six-speed gearbox with a magnesium housing, which delivers power to the 31-centimentre-wide rear wheels. The changeover to the new engine generation is now complete. After the 911 GT3 R and the 911 GT3 Cup, the spearhead of Porsche GT racing cars is now also powered by the same cutting-edge six-cylinder boxer engine family. In the past, Porsche has already thoroughly pushed the limits with the concept of the 911 - in 1996 with the 911 GT1. With great success: In 1998 the 911 GT1 achieved the 16th overall victory for Porsche at the Le Mans 24-hour race. Back then, the fastest vehicle in the field emerged from the GT1 class. 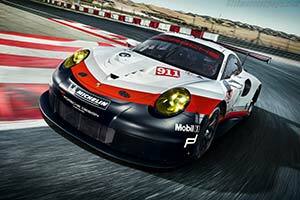 For the first time, a Porsche GT race car features state-of-the-art assistance systems: the new 911 RSR is equipped with a radar-supported collision warning system, the so-called "Collision Avoid System". Even in the dark, the faster LMP prototypes are detected early enough and misunderstandings can be avoided. A new safety cage concept and a new, rigidly-mounted racing seat enhance driver safety. With the seat fixed to the chassis, the pedalry can now been moved and adjusted to fit the driver. The new 911 RSR's serviceability has also been significantly improved: Entire elements of the carbon-fibre body can be exchanged completely in a very short time thanks to clever quick-release fasteners. Moreover, changes to the suspension setup can be performed much more quickly and easily. With the look of the body wrapping, the 911 RSR is striking out in a new direction: For the first time, the GT racer bears the new factory design that has further developed the clear and dynamic design language of Porsche Motorsport. From a bird's eye view, a hint of the Porsche emblem silhouette can be seen. The basic colours remain white, red and black. In the 2017 season, the factory is expected to run the new 911 RSR at 19 outings which equates to more than 140 hours of racing. With two factory-entries, Porsche will tackle the FIA World Endurance Championship (WEC) including the 24 Hours of Le Mans as well as the American IMSA Weathertech Championship. The new racer will celebrate its debut under the toughest conditions at the IMSA season opener in Daytona on 28-29 January. "We're very well prepared for this," says Marco Ujhasi, Head of GT Works Sport. "Since its first rollout in Weissach in March this year we've covered 35,000 test kilometres on racetracks in Europe and North America - that's more than in the development of any other Porsche GT racer."